All you need to build experiments 12-24 in the Make: Electronics book. The second companion pack to the Make: Electronics book covers the experiments from Chapters 3 and 4. We've spent hours sourcing these hard-to-find parts! This pack continues where Components Pack 1 left off and delves into integrated circuits, digital electronics and soldering skills. With over 130 components, organized in a rugged tackle-style box, you'll be ready to start working on some excellent projects as soon as you crack open this unique, hands-on book. Build the circuits first, then learn the theory behind them. 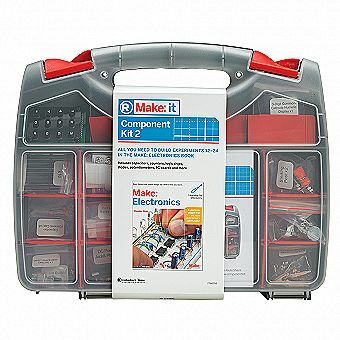 With Make: Electronics, you'll learn all of the basic components and important principles through a series of "learn by discovery" experiments. And, you don't need to know a thing about electricity to get started. At ProTechTrader our goal is to deliver great products at great prices and our priority is out of this world customer service. Being customer certified means ProTechTrader has a rating of satisfactory or better on all twelve quality rating dimensions of service that are evaluated from the post sale surveys. Be sure to let us know how we are doing by completing a survey after your next purchase on ProTechTrader!